I have W.W. Jacobs monkey's paw under my bed. Not the infamous short story that warns us to be careful what we wish for. No, I have the actual genie-in-a-dead-simians-claw wrapped up in an old copy of 'House of Mystery' issue 267. I had two wishes. It heard me. 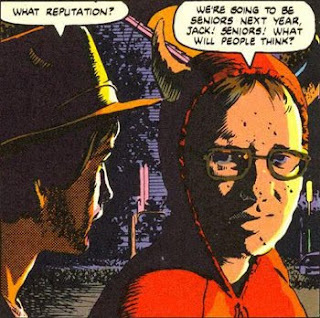 Wish number one was that I could find a Kaluta-illustrated story that I would be comfortable plopping into my list of 'Best Horror Comic Stories Ever'. Wish number two was that I could find a really good recent horror comic story that I would be comfortable plopping into my list of 'Best Horror Comic Stories Ever'. It wasn't as good as 'Hellblazer' (but then again, what is?). Those were the last issues I bought. The blogosphere is a pretty cool place. I couldn't find a story that featured M.W. Kaluta to feature in my 'Best Horror Comic Stories' but maybe I could honor him with a cover. Kaluta's highly intricate and detailed style made for pretty amazing covers. It was during this search that I happened across "Spellbound" in Harris Smith's 'Negative Pleasure' blog. There, I said it. Mr. Sturges has made a great new monster archetype. That's what horror stories are y'know? An archetype with a morality lesson tossed in. A ghost story is the consequence of murder. 'Frankenstein' is scientific hubris. 'The Monkey's Paw' is being careful what you wish for. 'Little Red Riding Hood' is don't wander off into the woods with wolfish boys. And thralls? Thralls are the siren lure to lose yourself, forget your troubles and just let go. But when you pack up your troubles in your old kit bag and smile, smile, smile, don't get too close to the Abyss. When you run too far from your worldly concerns, you enter the 'other' world. And they can make it all go away... After all, wasn't that what you wanted? Oh, and my third wish? I've got a monkey's paw with two fingers down, Hollywood.